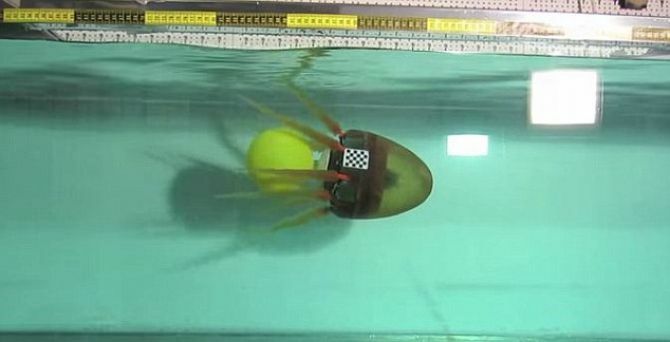 Just when you thought it was safe to go into the water: Octobot robot octopuses! In the past, understanding the world used to be so much easier: mail went by post not by wire; a drone was somebody who bored you, not somebody who bombed you; and robots were big, made of metal, and rusted in water – not small, soft and swimming. Today email has largely replaced mail, and drones hunt targets from the sky. Luckily, we still know where are with robots, don't we? Sorry, but no. Robocop has now been superseded by Octobot. Engineers in the USA and Italy have built and tested autonomous soft robots that look like an octopus, wrap their arms around objects like an octopus, and swim through water like an octopus. OK, I'll admit that last one is a stretch. 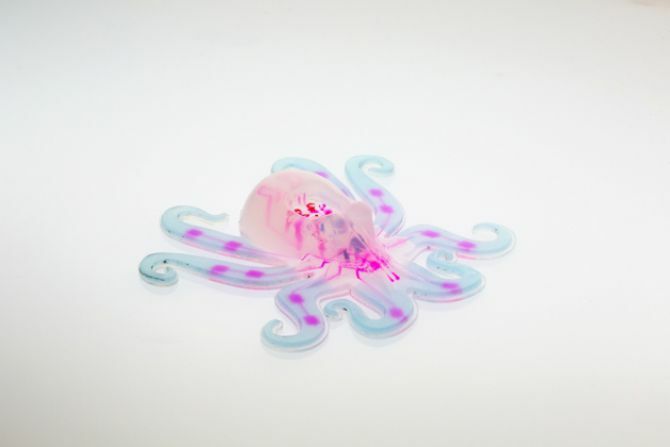 Octobots are made from a variety of silicone gels offering varying stiffness and powered by chemical reactions that push gas in and out of chambers in their eerily flexible legs. Thanks to the use of chemical reactions instead of electricity for power, Octobots do not require ridged and corrosion-prone components like batteries. A small pre-programmed microchip controls the movements of the arms. The fuel is a hydrogen peroxide solution that is exposed to platinum particles infused into two of the robot's internal "arteries." When the hydrogen peroxide is strategically released by the microchip and hits the platinum, it rapidly breaks down into water and oxygen. The resulting burst of pressurized gas inflates, extending one set of arms before eventually exhausting through vents. 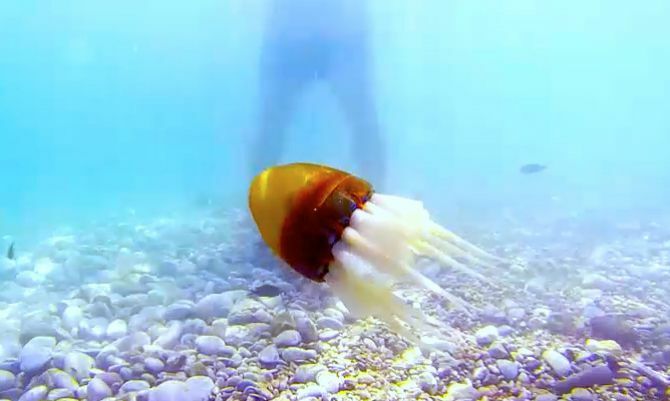 While today's Octobots are more laboratory proof-of-concept models than practical eight-armed underwater R2D2s, that is likely to change in the not-too-distant future. 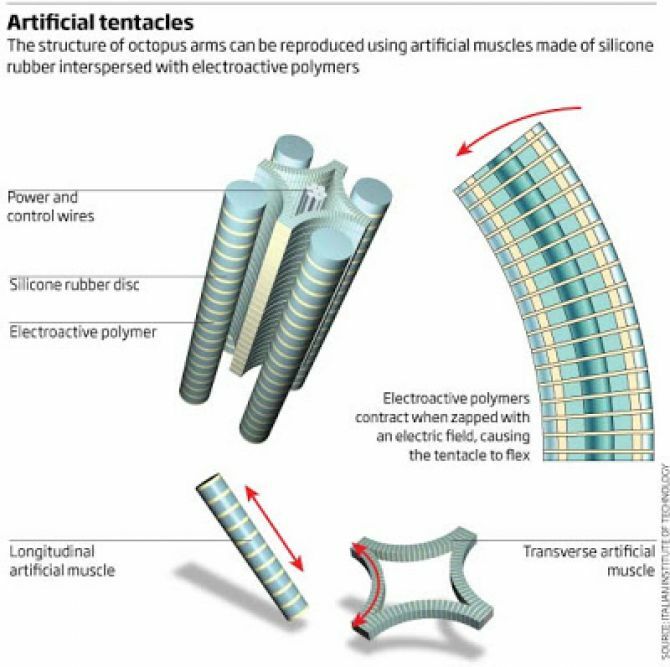 The present generation of Octobots currently run for a maximum of eight minutes on one miniscule millilitre of fuel. So if you feel something wrap around your legs next time you are at the beach, try to relax and convince yourself that it should drop off before you can count to 500! I wonder how long before we see the perfect watchstrap: one that wraps around the wrist securely, though not too securely, automatically adjusting its size throughout the day or on any size wrist?